Ohhhhh baby books. Those two little words can conjure up all kinds of emotions, but one emotional constant I've seen when it comes to baby books is guilt, specifically "mommy guilt." More notably, I've yet to meet a mother who has joyously logged all of the baby gifts received, all of the baby shower attendees, and so forth. I've experienced this first-hand. I purchased a beautiful light blue fabric-bound baby book for my son two weeks before he was born. The thought hit me like a freight train: "Oh no, I don't have a baby book!!" What's more, I felt the need to buy one of the nicest options on the market. I promptly brought the book home and placed it on my shelf. That was three and half years ago. Recently - probably after having Frozen on a loop in my house - I decided to "let it go" and practice what I preach to my clients. The book had stared me down for years and the guilt laser beam coming from that shelf was all too much. Why was I treating myself like this? Certainly my children wouldn't want this for me. There were times I'd pick up the book to work on it and immediately put it back down. Because. I. Just. Couldn't. Let's be honest: baby books aren't fun to fill out - it's a chore. If it weren't, completed baby books would be seen in nurseries everywhere. And I'm pretty sure my children aren't going to care about what famous people share their birthday (who thinks of these questions?!). This issue touches mothers of all generations. No matter your age or the amount of technology at your fingertips, the story is always the same: it's not going to happen. Yes, documenting the infancy of your children is important and sharing some pictures, stats, and memories of this precious time with my kiddos when they're older is something I look forward to. But the process of collecting this information has got to be easy and enjoyable. 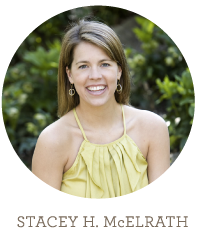 A family blog: This is certainly easier and more enjoyable if you're tech savvy, but I would caution you to think twice about this if you're not sure you can fully commit - otherwise, your blog will die a slow death like the baby books. Digital baby books: like this one, this one (they'll even send you guilt lasers reminders), and this one - but again, think carefully about your habits and the likelihood of completion. Baby email: When your children are born, set up an email address for them and over the years send them photos, notes, stories, etc. Not sure about email? Then write your children a personal note on special occasions and store them until your kids are old enough to appreciate them. I get a card for each child on Christmas, Easter, and their birthdays and write a special note. I love doing this, plus three cards per year per child is manageable for me. Photo albums: When I finally moved on from my son's baby book, I still wanted something tangible from his first days, so I purchased one of those inexpensive "brag books" with 20 or so photo slots and filled it with pictures from the hospital. The project took less than an hour (thanks iPhoto!) and it was fun for me. I did it again for my daughter and both albums are kept out in their rooms so we can relive those special days. If you're looking for something a little fancier though, printed photo albums - from less expensive ChatBooks and MixBooks to more formal lay-flat albums like these from Artifact Uprising and Parabo Press - are always an option. 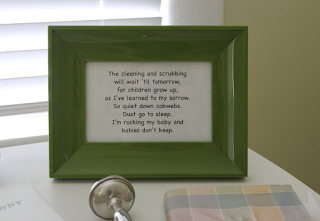 Baby milestone cards and my first year posters: Great alternatives to a traditional baby book. I also love the My Quotable Kid journal - my sister gave my son this journal on his first birthday and we love it! We keep it on his bookshelf so we can easily see it and regularly add to it. A good old fashioned clear box (my faves) with a label (e.g. "Baby Stacey"): Fill it with ultrasound pictures, hospital bracelets, and other keepsakes. Easy peasy! And want to remember baby's first word and other highlights? Jot them down on a notecard and throw it in the box. 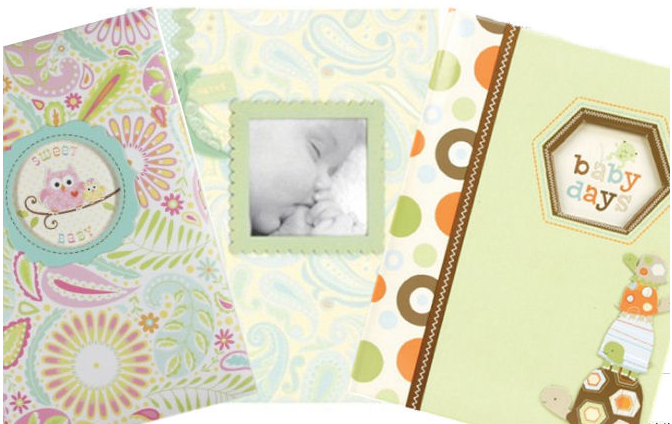 I'm giving you permission to use index cards instead of homemade shrines for your baby's milestones. Bottom line: find a method that works for you. The higher the price or the greater the effort does not represent the amount of love you have for your children. If you have alternative baby book ideas, let me know - I'd love to hear from you! Stay tuned for a similar blog post: kids' artwork! UPDATE (as of 11/6/15): I recently learned about Chronicle Books. This is another alternative to baby email, but more custom than a greeting card. Their tag line is "Write Now. Read Later. Treasure Forever." Check them out! UPDATE (as of 1/4/16): I recently learned about Qeepsake. Once a day, Qeepsake texts you a question about your child (e.g. "What makes Stacey smile?") and you text back the answer which is then added to your child's journal. Now that's the kind of journal I can keep up with! UPDATE (as of 1/28/16): I recently learned about EveryStory. This is a great way to capture the stories behind your pictures - simply record, save, and share! It's been awhile since I've written, but I have some fun organizing treats in store for 2015 and can't wait to share them with you! I spent some time over the holidays getting really real (look away Grammar teachers) with my recipes, kitchen tools, clothes, etc. 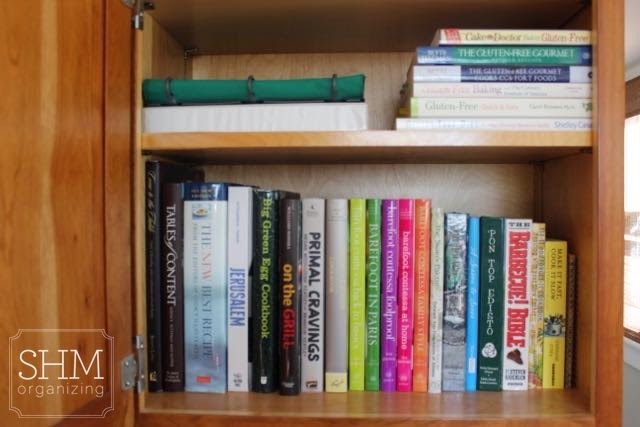 First topic on the chopping block organizing checklist: my recipe and cookbook collection. But first...in case you missed it, SHMorganizing was in the news! Special thanks to Celebrate Magazine for asking me to assist with their "Refresh Your Home: Get Organized" piece. To read the full article, be sure to pick up their Jan/Feb issue on newsstands now. As I mentioned in Celebrate's article, magazines and cookbooks are famous for being massively accumulated then forgotten about. And when it comes to meal planning, if you don't have your game face on then your time, energy, and resources pay the price. We've been in a food rut lately and I believe that's because our system wasn't working. Similar to our manuals, we had everything in the same place but there was no functionality. The biggest issue was our loose recipes (e.g. index cards, online recipe print-outs, newspaper cut-outs, etc. )...yes they were all in one folder, but one dare not open it. I put my SHMorganizing hat on and got to work! I pulled all of the cookbooks out and found a couple to donate. I reviewed all of the loose recipes and tossed at least two dozen. Remember: get real with yourself. I love a great meal, but cooking isn't one of my passions. So other than several "fancy" recipes I use for holidays and celebrations, why was I hanging onto meals that kept me at the stove longer than at the dinner table with the people I love?! 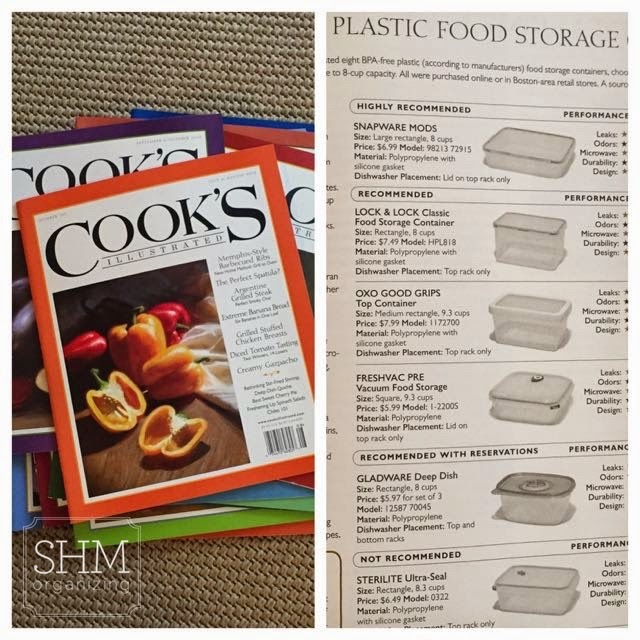 Finally, I tore out all of the recipes and kitchen tips I had flagged in magazines and recycled what was left. 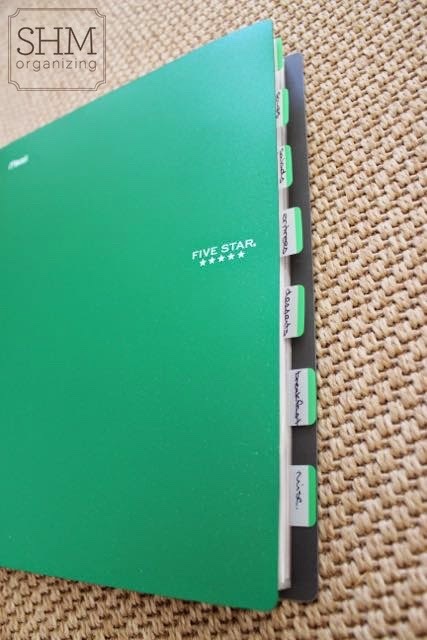 When the time came to put everything back together, I went with the Five Star Flex 1" Hybrid NoteBinder. The pages can be tucked under and the special rings won't break or misalign. Not fancy, but oh so easy to use! I purchased some clear sheet protectors and loaded each sleeve with two recipes (front and back), then categorized them by appetizers, soups & chili, salads & sides, and so forth. If the recipe was an odd size - an index card, for example - I taped it to a letter-size piece of paper so it would stay in place. Traditional tab dividers don't stick out far enough when you use sheet protectors, so I used Post-it Writable Tabs and labeled accordingly. 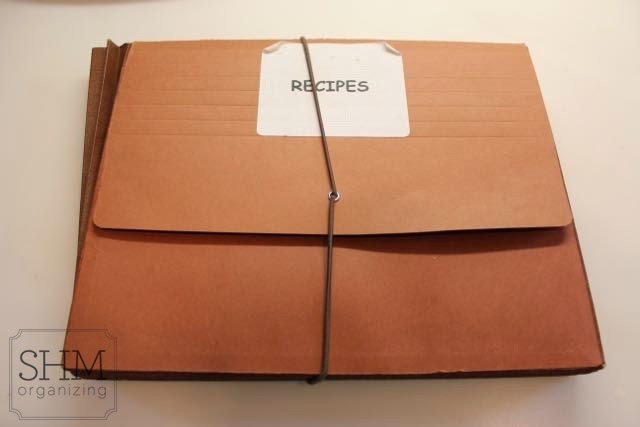 Finally - my favorite part - I put a velcro binder pocket in the front of the binder for recipes I want to try soon or recipes we haven't made in awhile. So when it's the eleventh hour and I need a meal, I know right where to go! * Realistically think about your cooking abilities, likes & dislikes, time, ingredient budget, etc. * Respect the space you have and acknowledge limits. 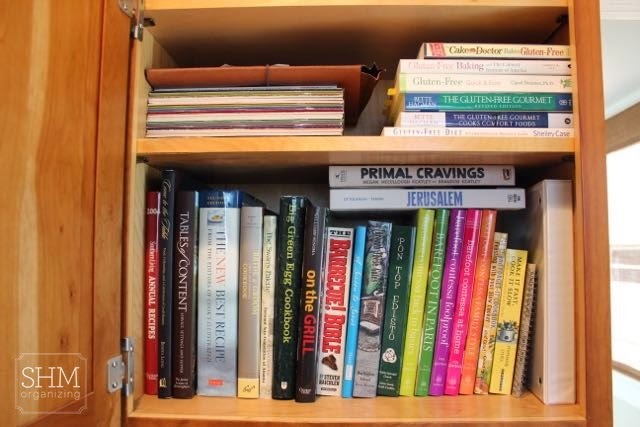 Overcrowded cookbook shelf? Time to purge. Plus you're more likely to use and maintain a tidy space. * Don't let such things make you feel guilty. Tried enough recipes in a cookbook to know it's not a good match? Donate that sucker and give it new life! As the saying goes: keep the best, get rid of the rest. * Look through and edit your recipes a couple times per year so your collection stays manageable. * Use what you love. 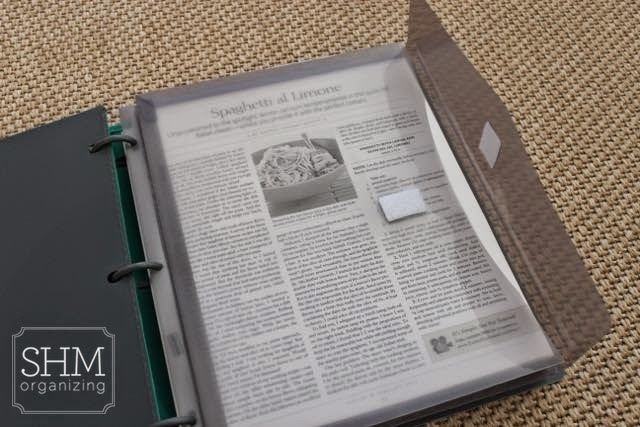 Prefer a fancier recipe binder? Need more categories? Etc. etc. etc. Use supplies you love so you'll love to use your supplies. * Ready to go paperless? Consider a personalized & digital cookbook app like Paprika or My Recipe Book.